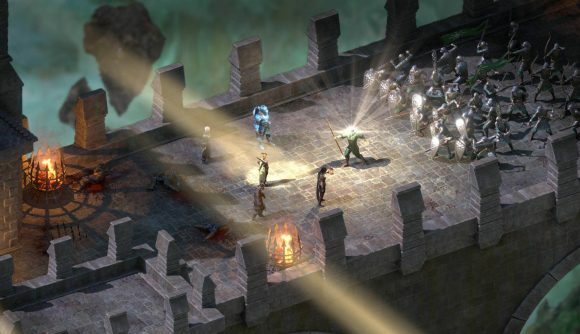 Since work on the main Pillars of Eternity 2 base game wrapped, studio design director and RPG legend Josh Sawyer is no longer involved in the core creative direction of the game’s post-release content. But that’s not to say he’s not a key member of the Pillars 2 crew; while he’s not the captain of the paid-for DLC expansions, Sawyer is still a guiding hand on the game’s free DLC God Challenges. Talking to us at Gamescom 2018, Sawyer explains the idea behind these top-level challenges: “They are special modes where, for example, in the Berath challenge, any character that is knocked out for six seconds dies.” Think of these as mutators or modifiers for your campaign that alter the core rules of the game, making progression just that little more tricky. And Berath’s challenge isn’t the toughest by any means. “Magran’s challenge is even crazier. You can’t slow the game and you can’t pause the game, so everything has to be played with real time without pause and the AI system, which is really hard,” Sawyer says. The game is soon to patched with the first two God Challenges in update 2.0.1 – Abydon and Skaen – and further gods, including Berath and Magran, will be added over time. “We’re planning on introducing a God Challenge for every god, and that’ll all be through our free DLC,” says Josh, indicating that there will be 11 challenges for the 11 gods in the Pillars pantheon. Keep an eye out for the first challenges to be added to the game later this month.